Our banquets and catering choices will be a hit at your next event! Sit back and relax in our Seasonal Porch for a delicious Banquet Dinner. There’s no place quite Lake George, so come on over and enjoy the beauty of the region while indulging in delicious Italian cuisine. All of our dishes for our banquets and catering are served Family Style, so everyone can pass, share, and enjoy. Serving timeless Italian recipes with filling portions, everyone will leave wanting to come back for more! 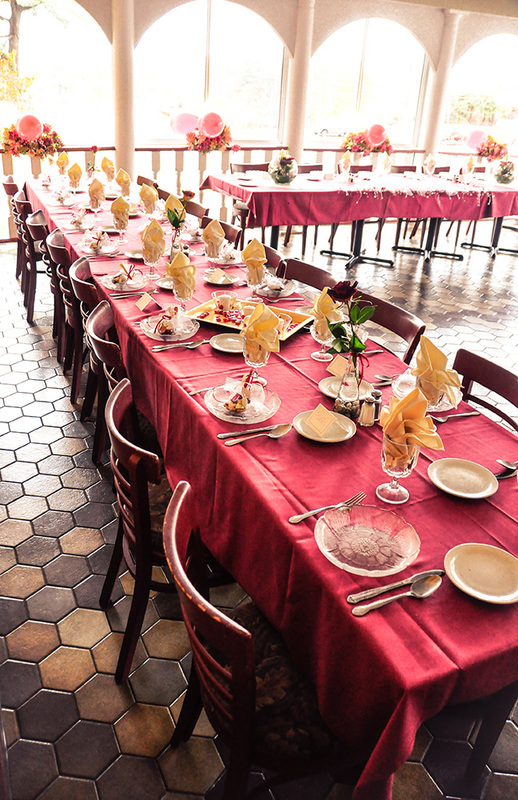 If you’re in Lake George area, or live nearby, call us today to schedule your banquet dinner. With seating for 50 people there is plenty of space to host a bridal brunch, rehearsal dinner, or any event. Want that home cooked Italian food at any location? Cater with Mama Riso’s and enjoy Italian specialties at all your events! Look through our menu for delicious Italian dishes you can enjoy with your family and friends. Whether you’re looking for a multi-course meal or casual Italian food, we will tailor our dishes to meet your needs. Mama Riso’s cater’s off site for up to 100 people, bringing fresh, delicious food right to you! Whether it’s a family reunion, party with friends, or a special event, Mama Riso’s will satisfy everyone! Contact us today to learn more about the areas we will deliver to. We offer 4 different packages for our catering services. Half Pan serves 6-8 people. Full Pan serves 15-18 people. PLEASE PROVIDE 24 HOURS NOTICE FOR ALL ORDERS. FREE DELIVERY OFFERED ON ORDERS OF $500 OR MORE! Half Pan serves 6-8 people. Full Pan serves 15-18 people.